The virtual currency that caught the public's attention last month when its value zoomed briefly past $200 kicked off its first Silicon Valley conference Friday evening and shows no sign of losing momentum. The event is small by Silicon Valley standards, with about 1000 attendees expected and 19 exhibitors, but it's bustling with startups launching new exchanges, software developers looking to strengthen the Bitcoin network, and venture capitalists seeking places to invest. There's now $45 million a day being traded on the Bitcoin network, or $16 billion a year, according to Peter Vessenes, chairman of the Bitcoin Foundation, who talked at the start of the event in San Jose. 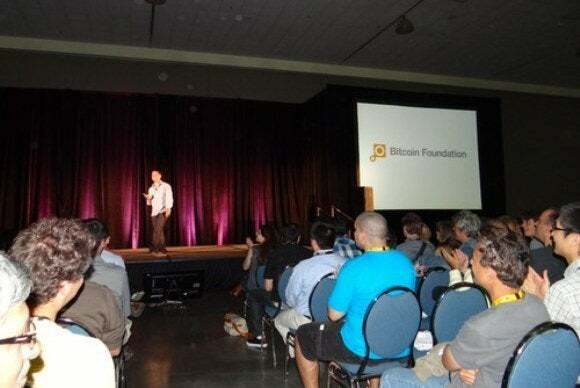 The chairman of the Bitcoin Foundation, Peter Vessenes, opens Bitcoin2013 on May 17. The volume of activity is accelerating, he said. There have been 18 million transactions in the four years since bitcoins were introduced, and the figure is expected to reach 20 million next month. With the increased activity has come greater value. Bitcoins were trading at about $125 Friday on the Mt. Gox exchange, down from their surge last month but still 24 times higher than at this time last year, when a bitcoin was worth $5.08. This will be a big year for competition, Vessenes said, and "whippersnapper" companies will emerge to unseat early leaders. "Someone's going to get rich this year on Bitcoin," he predicted. But there's also work to be done for the virtual currency to succeed. The Bitcoin Foundation, which has just two full-time staff, will hire a Washington lawyer this year to engage with politicians and try to hammer out a regulatory environment in which the virtual currency can thrive. The foundation will also hire two technologists, and establish international chapters to work with local regulators and help Bitcoin expand overseas, he said. Bitcoin is a currency that can be bought and sold much like any other, but it's managed and traded on a peer-to-peer computer network. Proponents say it allows frictionless payments anywhere in the world, and transaction fees are lower than those charged by companies such as Visa and MasterCard. Some "star power" was provided by Tyler and Cameron Winklevoss, the brothers best known for claiming to have given Mark Zuckerberg the idea for Facebook, and who are now investing in Bitcoin companies. Taking the stage after Vessenes, they gave a brief history of Bitcoin, starting from January 2009 when the first transaction was made. They too talked of the need for Bitcoin to mature. Almost half the exchanges that sprang up in the past few years failed, taking the Bitcoins under with them, said Cameron Winklevoss. "We need to create products that have better hit rates than that," he said. Bitcoin also needs to become easier to use. It's simpler to explain the value proposition of Bitcoin than it is to show someone how to actually use it, Cameron Winklevoss said. "That should be the other way around." But the brothers are clearly believers in the virtual currency. They started their talk loftily, with a quote from Mahatma Gandhi: "First they ignore you, then they laugh at you, then they fight you, then you win." They believe that will be the trajectory for Bitcoin, too. Chocolate bitcoins at the Bitcoin Foundation event. The surge in Bitcoin's value in March and April wasn't a bubble or a sign of mania, they said, it was just "rapid adoption". And while the price of Bitcoins can fluctuate sharply—something skeptics point to as a big drawback—"the trend is upwards," Cameron Winklevoss said. "We've bet on the horse and not the donkey here," he said. There's a proud geek culture at the event, and Friday's activities wrapped up with a group outing to the theater across the street, to watch "Star Trek Into Darkness." 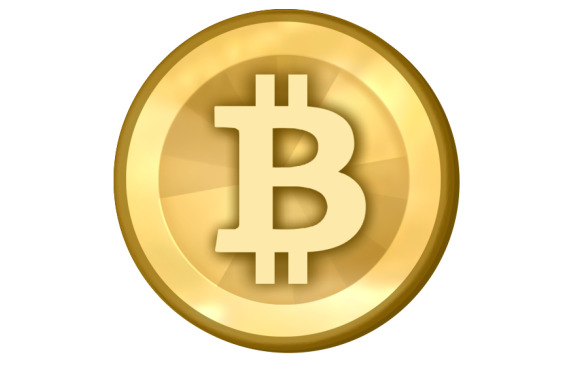 Bitcoin 2013 continues Saturday and Sunday with talks about the evolution of the technology platform, regulations, security, and other topics.